I baked these delicious Hershey’s Brownie Cupcakes for our anniversary. Walnuts and chocolate both hubby’s favourites. Actually, the day began with me not feeling so good there were some tests that were due and I was frankly worried. So I did not think I will be baking! In fact, we had taken the family out for the celebratory dinner one day early. In the evening I wanted to bake as I was given the all clear signal and when I was searching for brownies this recipe from Hershey’s was something I wanted to try. Simple one bowl recipe, as the recipe calls, use a spoon to beat your batter and you have one spatula-less to wash. Call me lazy or whatever I like to be out of the kitchen as soon as possible. By the way, I have used Malaysian cocoa powder it gives you a very dark chocolate colour but the taste is awesome. I will next time use white sugar with the cocoa. Perfect for the BM theme Let them eat Brownies. The other brownies that I have tried are Whole-Wheat Brownies, Brownies, Quick Fix Microwave Brownie(Egg-Less), Triple Joy Brownies. 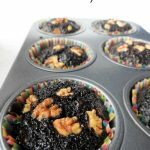 Line 2-1/2-inch muffins cups with paper liners. In a large microwaveable bowl melt the butter on 100% power (Took me 45seconds). Stir in the cocoa until smooth with spoon. Next tip in both the sugars and stir till blended. Fold in the flour, baking powder and 1 cup nuts; stir until well blended. Fill the muffin cups about 2/3 full with batter. Sprinkle remaining nuts over top of each. Bake 22 to 25 minutes or until tops are cracked and feel firm (will be moist inside). Cool in muffin tray on wire rack about 15 minutes. 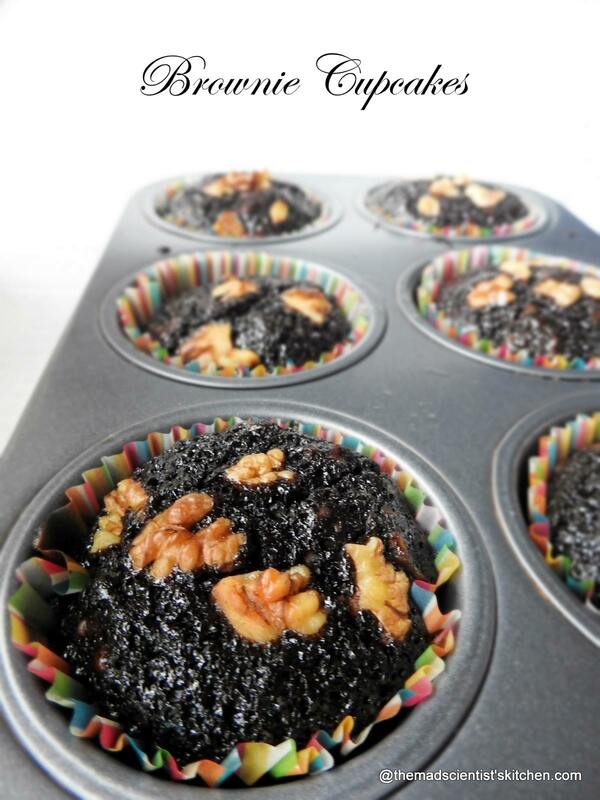 Remove from muffin cups and cool completely. 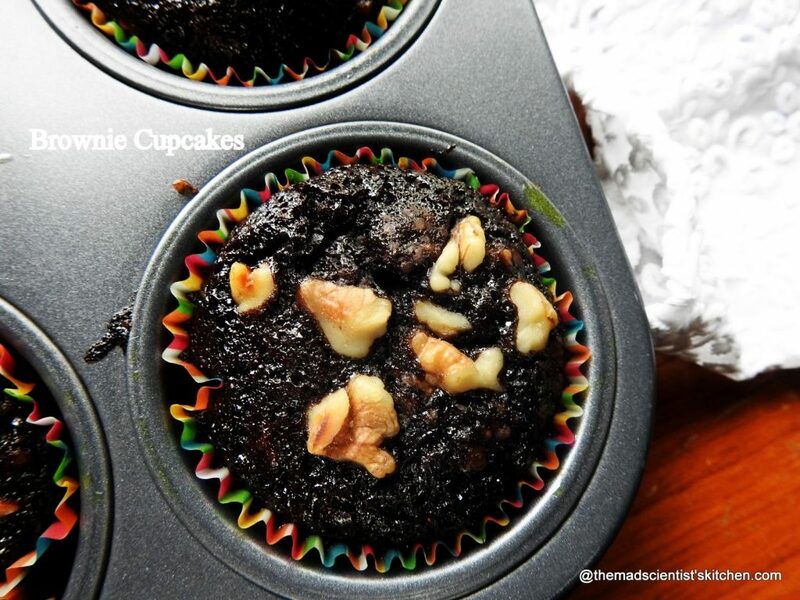 The brownie cup cakes look like a treat , I am sure you guys must have had a nice treat . Best wishes on your anniversary , may you rock together . Brownie cupcakes looks so tempting. Wow! 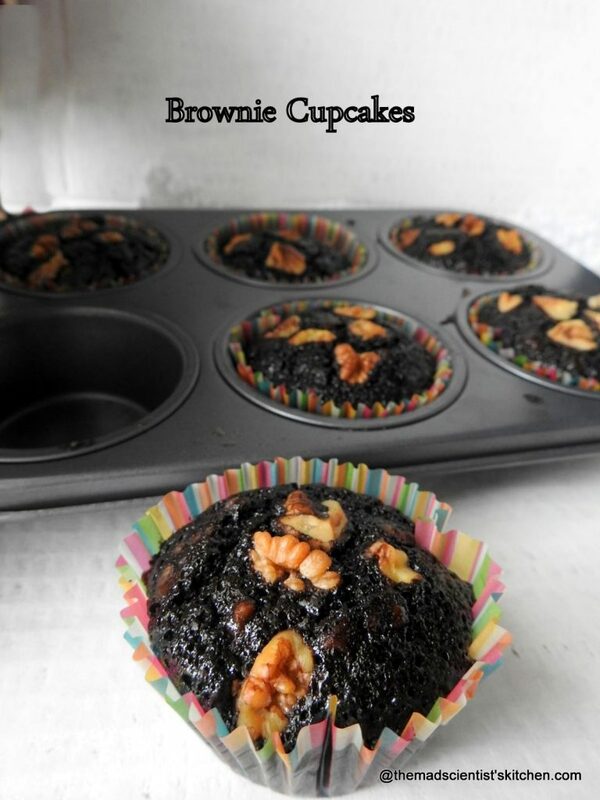 these brownie cupcakes look amazing. Just want to grab these. I like quick and easy recipes too. This one sounds easy and looks delicious. A bit delayed but wishing you both a very happy life together. Brownie Cupcakes is an awesome idea. Looks so yummy. Wow arch, too good, that dark color of the cupcakes are too tempting!!! Brownie cupcakes look super yummy. Walnut in brownies are match made in heaven. This brownie in form of cupcake looks absolutely yum. Happy belated anniversary Arch.